A. Martini & Co was selected to perform CM/GC work for the new lululemon store and the base building on Walnut Street in Shadyside. The scope included extensive demolition of an existing two story and basement retail space, located in the center of the busy retail street. lululemon occupies 1 1/2 floors of the building. Careful coordination of pedestrian safety was necessary. 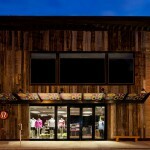 The new storefront consisted of installation of reclaimed barn wood which needed to be sealed on the underside, due to the existing facade conditions. Two new AC units were installed on the roof, and the restrooms were completely refurbished.